through the orange islands. Tracy is a "Pokemon Watcher", meaning he watches Pokemon, draw pictures of them, and studies them. When He founds out that ash and misty know Professor Oak, he "invites himself in" and from then on he rides on the lapras with ash and misty. The funny thing is that every time he sees professor oak, he gets massively hiper, and he has stars in his eyes. Tracy joins in the episode after Brock leaves. He meets Ash when Ash finds some kids treating a Lapras badly. When he is challenged to a battle, Tracy appears and makes some comments about the baddies' Pokemon being poorly etc. and Ash's Pikachu "electrifying". Tracy owns a Venonat, a Marril and later on, an old Scyther. He is quite intelligent and is a Pokemon "Watcher" and has a particular liking to Prof. Oak. He wears a kinda' jogging outfit. He knows a lot about the Orange Islands. replaces Brock as the "wise one". He has a Marril, Venonat, and a Scyther. Tracey is a Pokemon Watcher from Tangelo Island. He draws everything he sees and seems to be very interested in working with Professor Oak. He doesn't just draw Pokemon, sometimes he draws girls, claiming, "I need to make some observations." He's really smart and knows a lot about the Orange Islands. He's kind of a "fraidy cat" though. (But not as scared as Team Rocket! Prof. Oak's gonna fire him in the future, so he has to go with Ash again. That would be good, he's better than Brock anyway (though not as funny). Tracey is a PokèMon Watcher from the Orange Islands league. He tags along with Ash after he finds out that Ash is doing favours for Professor Oak, His hero. We find out along the way that Tracey has some of the attributes of Brock, caring for sick PokèMon and sharing Brock’s taste for girls at the same time. He develops theories about Togepi’s attacks also. 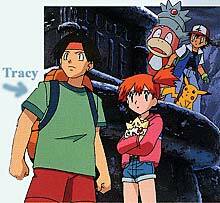 After Ash, Misty and Tracey return to professor Oak, Tracey decides to stay with Professor Oak to further his studies. Japanese Human names.) profile. So sue me. like him a lot, but that's no reason to dislike Kenji-kun.